I describe the last few hard years of my life as my wilderness wanderings. The saddest part of my confession? Accepting that the wilderness might be where I would live out the remainder of my days…I was wrong. I had it wrong. I do not believe that to be God’s Will for my life. The moment I confessed that the blessings I saw so many enjoying simply weren’t my lot MAY have been the moment I found myself in the depths of my despair…#ButGod. I didn’t even know what to call what I was experiencing at the time-suffice it to say that it was painful. It was discouraging. It was hard. The faith I had was enough to get me there, to lead me to the threshold of this hard place. What I didn’t know, what I hadn’t realized was that I needed a deeper, broader, far more surrendered faith to see the way out. I needed a deeper, broader, fully surrendered faith to see that the wilderness was never the point, nor had it been my location for that time. I now thank God for changing my lens; for changing me. In learning this new thing, in appreciating this personal revelation, I was reminded of a line by Stormie Ormartian. My faith over the last several years of my life provided “just enough light for the step” I was on…and it was enough. All that time, I wasn’t lost in the wilderness; I was sowing. 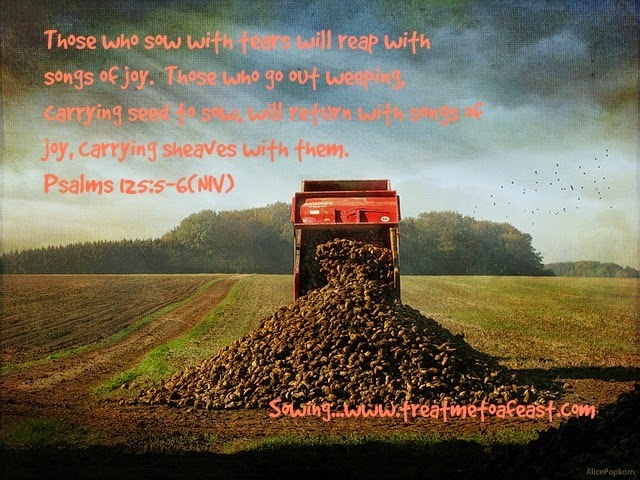 Though the sowing of seed is a work of labor and sorrow - often a work so burdening the farmer that he weeps - yet the return - the harvest - is accompanied with rejoicing. Yet the harvest. Yet the return. Now, finally, now that I understand where I was and the lessons I needed to master, now, only now, I can prepare to reap. Listen....everything is working together for my good. It's good... Its working for my good. It's good…Its working for my good. I am ready to reap. I thank You, Lord, for the steadfastness You poured into me. I was too stubborn to give up, despite wanting to believe that the blessings I’d seen You pour into other’s lives were simply NOT for me. In my despair I began to believe that hard times would be enough. That is not Your Will. That does not mean that we will not endure trials, face hard lessons and heartbreak. However, you have promised to shower Your Righteousness over us. This is my message to you, the lesson I learned. Life is hard. Even though we are exhorted to find contentment in our circumstances, no matter the plight, we are never meant to believe that sorrow is our sole lot. Although we endure long seasons of hard times, His Grace and our tears combine to break up fallow ground, to release fears, to shatter our barriers, that we might be broken for His good. Broken that we might be fertile ground, ready to receive good seed. Broken that we would seek Him, even though our weeping, to return with songs of joy, reaping sheaves.